As we describe Makkah in poetry, we must also speak about it in prose. Poets and writers have been granted a grace that leads them to the belief in and contemplation of the skills and the wonderful creations of Allah. This is subtle sensitivity, improvisation, profundity and insight. The greatest arena, the assembling house, the gathering season, the meeting place, the conference, the resort of groups, the compass of the navigator, the Mussahar star, the focus of attention of the nomad in his desert, the focus of attention of the villager in his hamlet, the purified Holy Mosque of Allah, His Ancient Curtained House towards which Allah directed the faces and commanded Muslims to perform Hajj to it, and Muslims turn their faces towards it five times a day in mosques. Allah erected it in a pure, sinless space in which life has not set its vanities and trifles, and evil has not yet reached it. Allah might have built His House in Egypt with its overflowing river and in a valley full of gardens. He might have built it, if He wished, in AI-Sham with its shaded canals, green hills and lush foliage. If Allah wished, He might have raised His House over the noses of tyrants, the kings of bygone ages, and over the heads of their gods, in lofty towers and decorated tombs. But Allah looked at Umm Ul Qura as a place humble to His power and needing for His Grace and Benevolence. 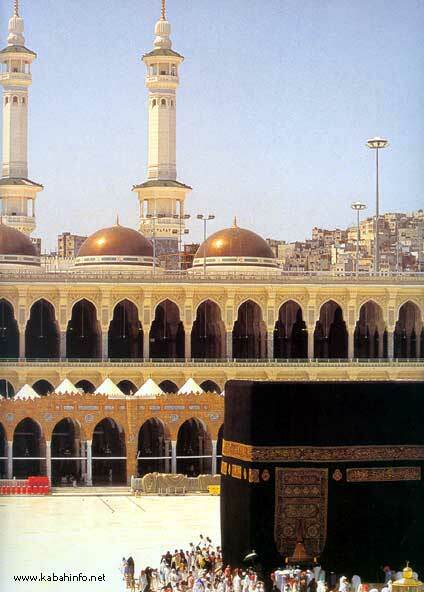 He also selected the site of the Holy Ka'bah where submissiveness that led to belief existed, and isolation that would help with worship and lead to monotheism when he found this place. He therefore, ordered Abraham, His Prophet and Chosen Servant, to raise the foundations of His House as a lighthouse of His Unity. It is a building that was erected with weakness and strength, which stood on the shoulder of maturity and youth. Fatherhood and sonship contributed to it. Abraham was working and Ismail was handing over until they constructed a building that exhausted the mattocks and was beyond the reach of those who had devastated Tadhmur and demolished Babel. Evil vanished and the wonders of perfect construction were evident and monotheism replaced paganism.